I can’t believe I don’t have a fish curry recipe on the blog yet. It’s just wrong of me. Because we end up making fish curry every week. At least once. What’s even more wrong is that I’m talking about fish curry today when I should be telling you about the most amazing weekend trip I got back from. Two blissful days spent at the Auroville village in Pondicherry, eating, barbecuing, sunning and chilling with friends. But I couldn’t wait because this kingfish curry with coconut and tamarind is a recipe everyone should have – the whole world so that they can experience what we do every week. That’s why fish curry took precedence over the Pondi trip. Although I have that coming up too. So be patient. 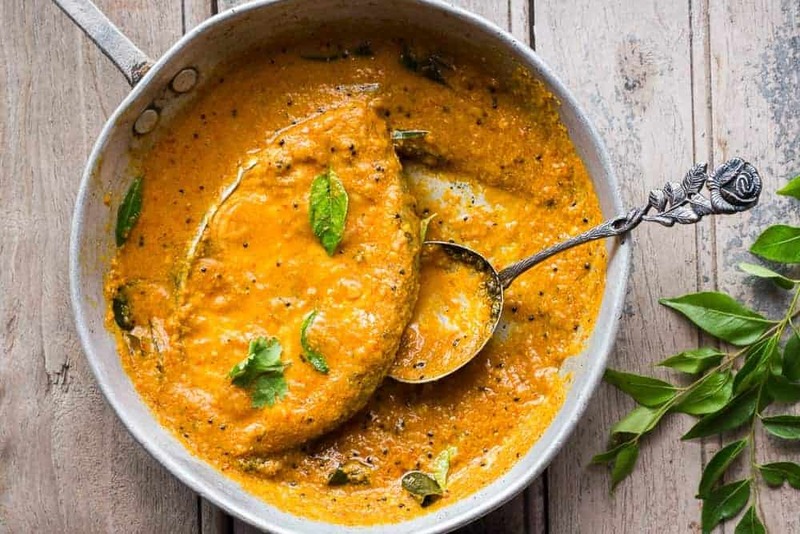 This is the kind of everyday fish curry recipe that you need in your life. 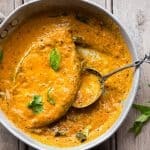 Now we all know how much Denver loves his Surmai (kingfish), which is why it features most often in our fish curries but you can just as well use any other fish you want. Mackerels work beautifully as do Pomfrets and I’ve even tried red snapper and prawns. 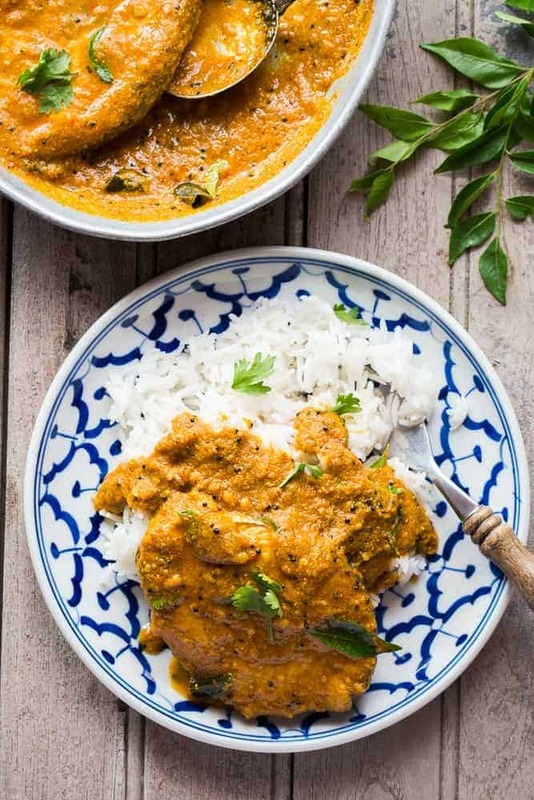 Which means that this fish curry is ideal for a weeknight dinner. You can just use whatever seafood is at hand and you have dinner ready in under 30 minutes. This curry is spicy and sour. I use a tiny amount of tamarind to add the tang, but it does volumes in terms of flavour. So I’m going to insist that you use it. If you don’t have some, buy it from your neighbourhood story or an Asian store if you are based out of India, but it’s a must. As is the coconut. Coconut and fish curries were made for each other and you can’t skip it either. If you are a curry lover, follow me on Pinterest and find new inspiration for weeknight dinners every day! I’d also love to hang out with you on Instagram so look me up there. An easy everyday kingfish (seer or surmai) curry with coconut and tamarind. Spicy, tangy and ready in 30 minutes! Clean and wash the fish slices and rub turmeric all over them. Cover and keep aside. Grind all the ingredients under paste till smooth with a tablespoon or two of water. Heat coconut oil in a large pan or kadhai and add mustard seeds. Once the seeds start spluttering, add the ground paste and cook while stirring once in awhile for 10 minutes. Slide the fish into the pan, and add salt and 3/4 cup water. Mix gently so as not to break the fish. Bring the curry to a boil, and lower the heat to a simmer. Add curry leaves and simmer for 15 minutes. 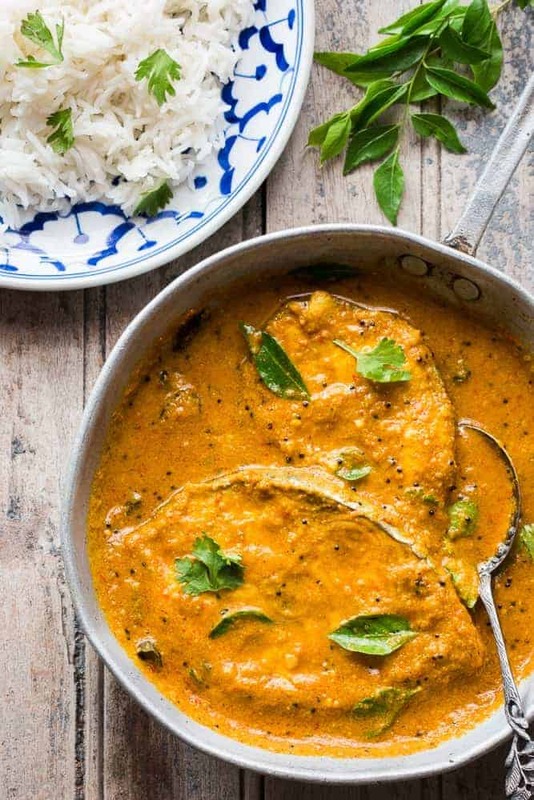 Top with coriander leaves and serve this spicy kingfish curry with steamed rice. Really this recipe is wonderful. I tried this recipe at home. By this recipe style, I’m also interested in cooking. Such an awesome recipe. Didn’t like it… 🙁 I don’t think it’s wise to grind the onion and tomato. Was like fish in chutney base!! Thank you so much for your feedback. I’m glad you liked it. Hey Githin, we prefer it this way, but cooking the onion and tomato in oil will also work well! Thanks! Just found your blog and made this. So delicious!